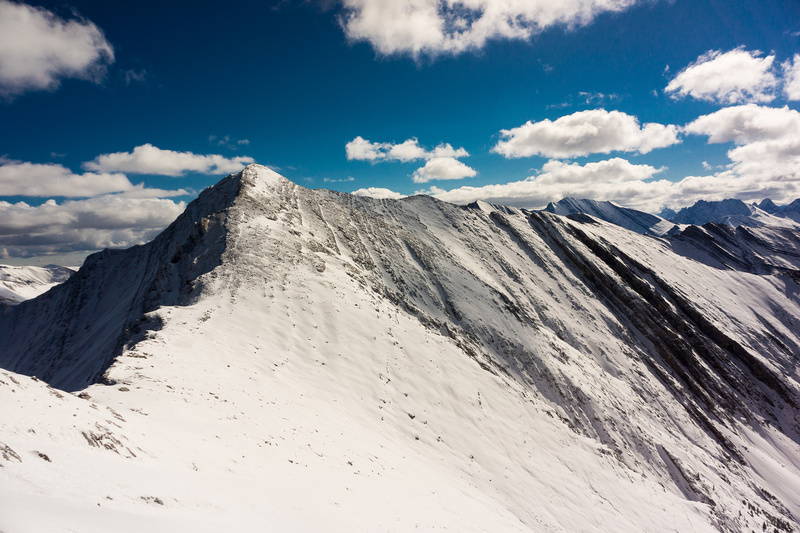 Difficulty Notes: There are some moderate scrambling sections (especially when snow covered) on the ridge traverse from Old Baldy towards Mount McDougall. Note: I got lost twice on this outing which accounts for all the extra height gain. On my last week off in the first week of October I decided to try a scramble in the fresh snow that the front ranges got. 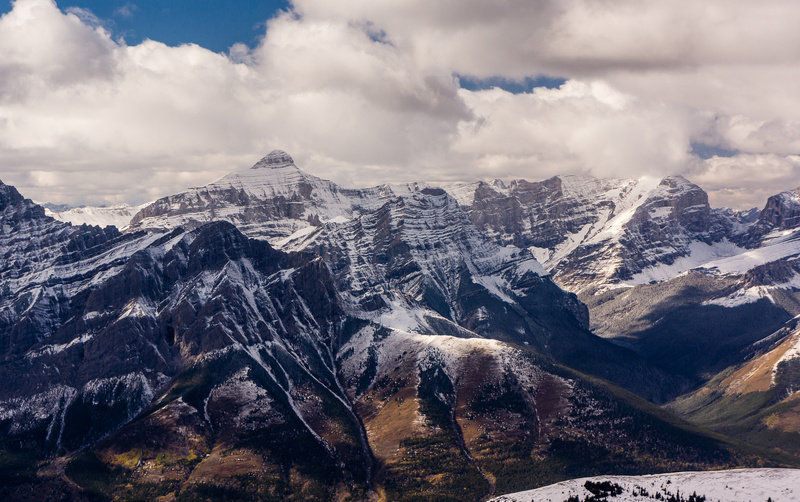 I don’t have a lot of Kananaskis front range peaks left to do so I looked in Andrew’s book for ideas. 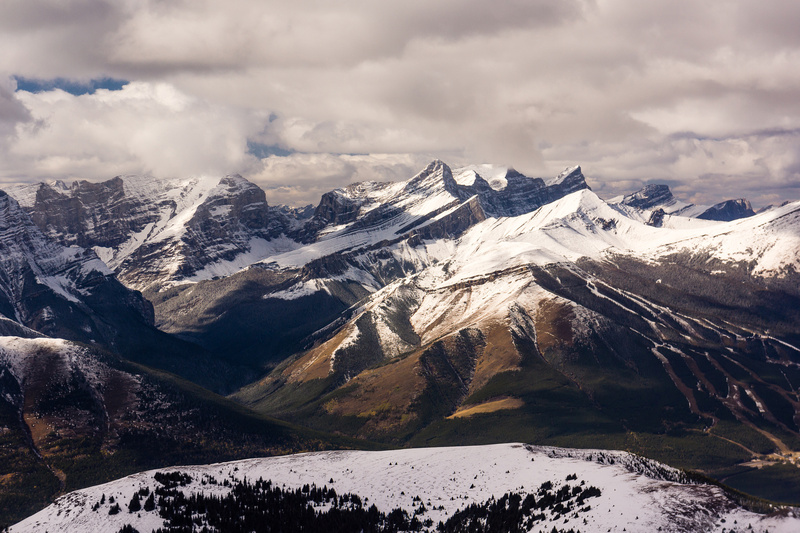 I settled on the last part of the “big traverse” that I had left – Old Baldy Mountain (GR356417 or McDougall NW2) and Mount McDougall. As I drove down hwy 40 I thought maybe I’d get lucky and have minimal snow on my approach trail. 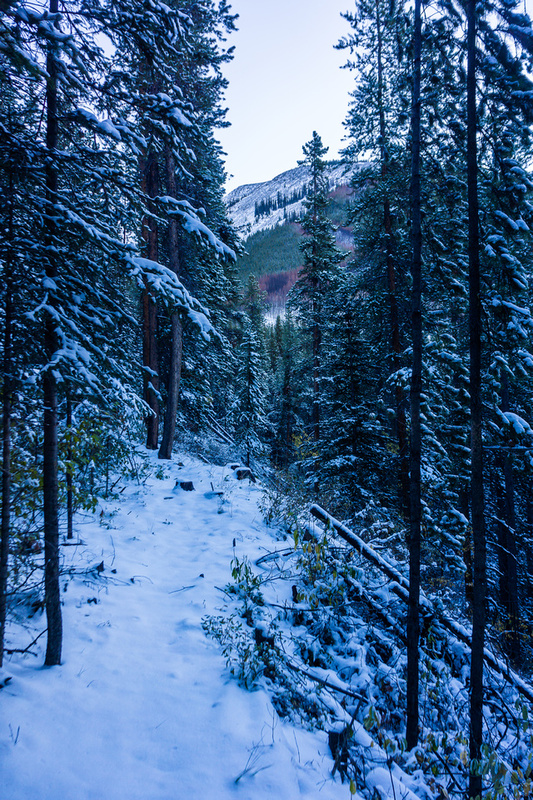 As I walked up the Evan Thomas trail I realized that there was probably more snow than I was initially counting on. 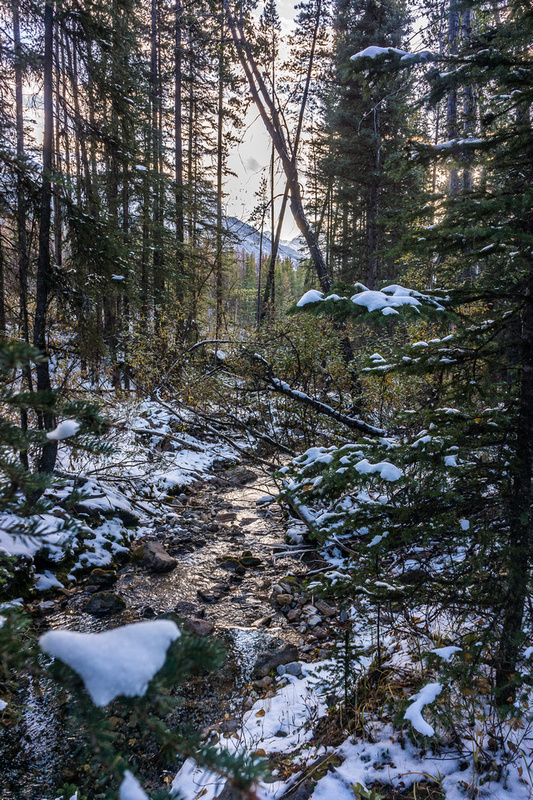 The small trail running up beside McDougall creek isn’t that obvious. Basically go a couple of hundred meters past the “trail not maintained” sign. You’ll crest a small hill with a trail on the left. Don’t take this one. Go another 50 meters and just before the creek there’s two small cairns with a trail in between. Follow this trail. I followed the trail no problem until it steepened and widened considerably. As I climbed higher the snow obviously deepened and soon was over my ankles. I tried following the trail high above the creek and of course I lost it. That sucked big time. Since I had no idea where the trail was supposed to go I did what peak baggers always do – I traversed way too high. By the time I finally realized that I was way off the trail I was getting a bit grumpy. It felt like I was wading through an endless amount of snow on slick side-hilling and wasn’t even on the mountain yet. At valley bottom in McDougall Creek. The snow gully I ascended from McDougall Pond. 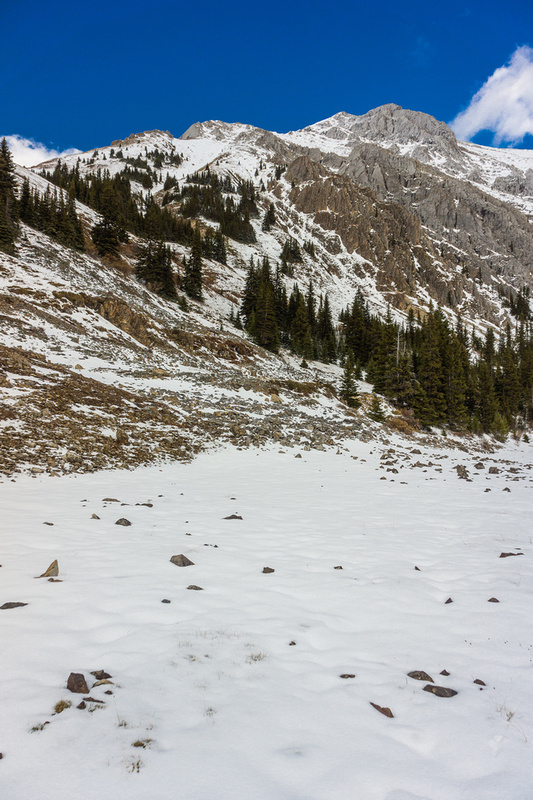 Finally I dropped down to the creek and followed the trail again (barely visible in ankle deep snow) to the small tarn. 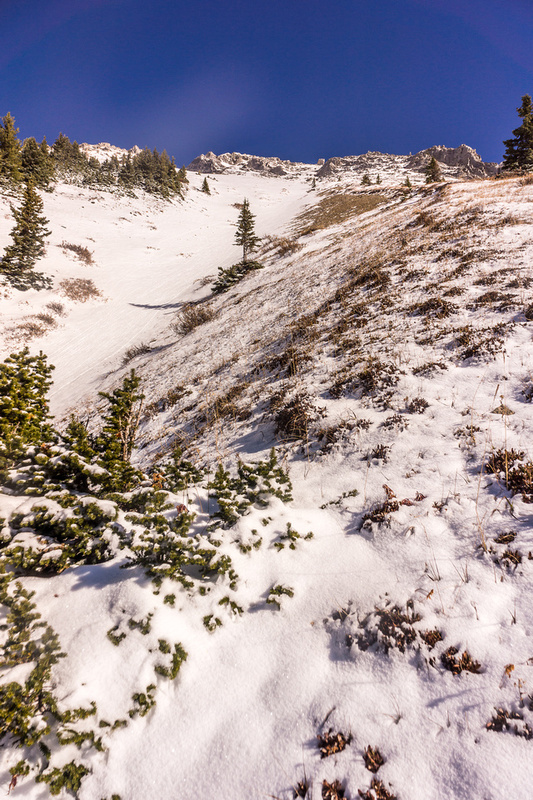 From there I began to kick steps up a snow gully leading to the west slopes of Old Baldy Mountain. This snow gully was awesome but also exhausting since I was the only one breaking trail. I wouldn’t come close to this gully once the next heavy snow fall fills it up as it’s a major terrain trap. 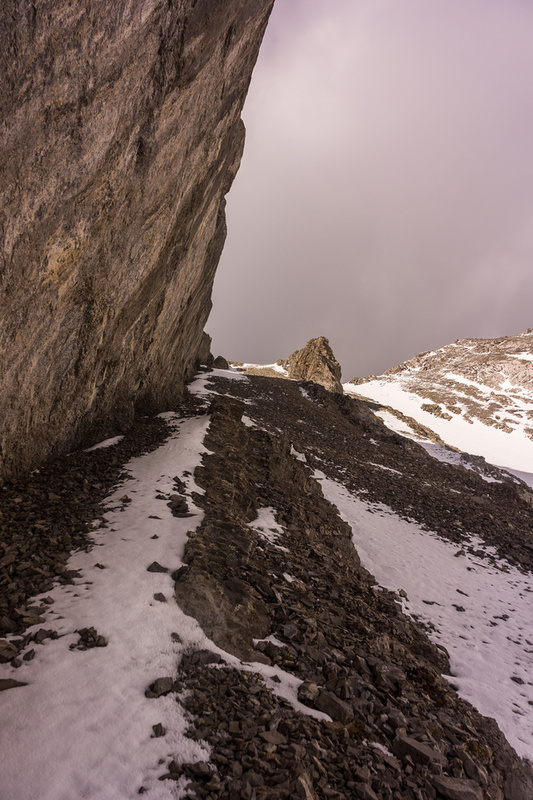 Once I reached the top of the gully I was almost ready to give up on the day. 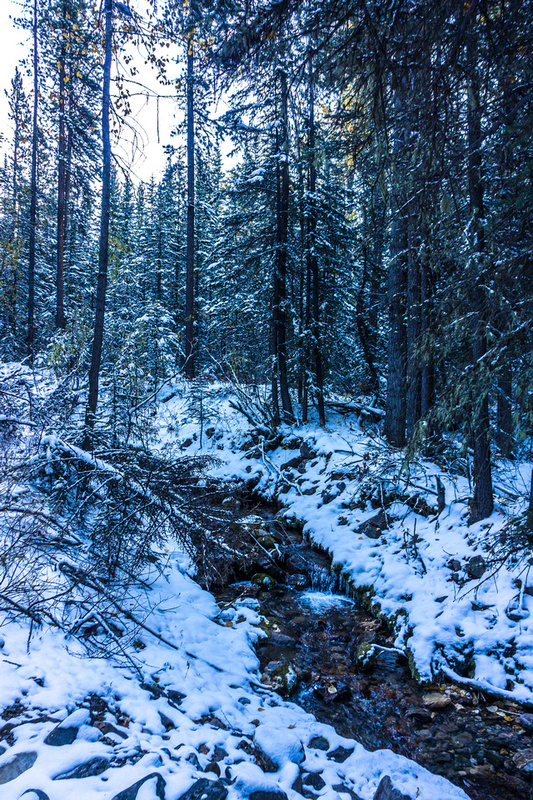 I was pretty tired already – the past few weeks have slowly worn my body down – and the amount of snow was getting annoying. My feet were already soaked because I stupidly forgot my gaiters and the route to the summit didn’t look easy with water ice, rime and slick snow on slabs. I decided the weather was nice enough that I might as well at least make the summit of Old Baldy while I was up this far anyway, so I kept going. 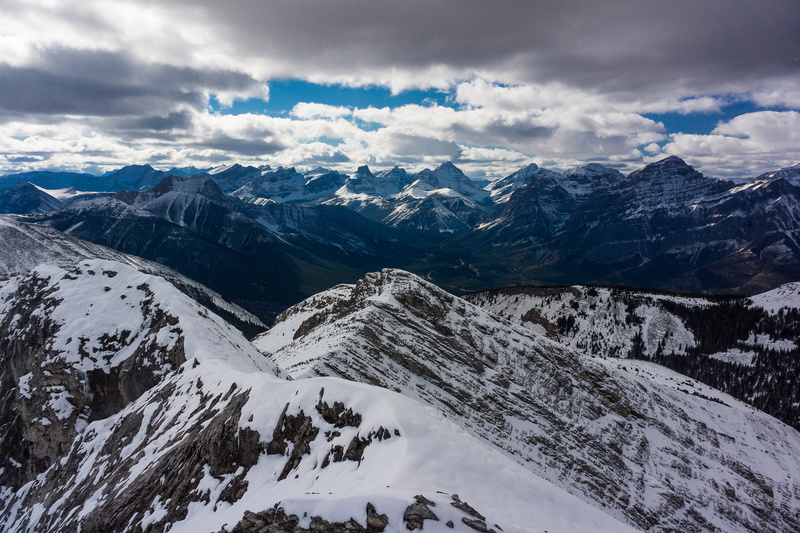 I ended up traversing on climber’s right of the ridge before finally gaining the summit of Old Baldy. Working my way along the east side of the ridge to the summit above. 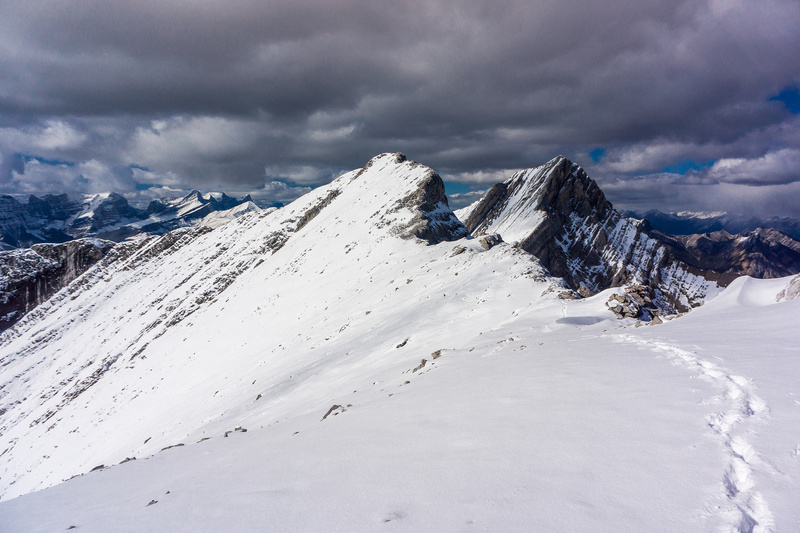 Due to the snow it was hard to know where the trail went near the summit so I stayed right on the ridge. This was more exposed than I was expecting and with the snowdrifts over my knees and water ice on the slabs I actually wasn’t sure I was going to make it! Near the top I decided to traverse over climber’s right and this worked well – I found a light track that led me up to the summit. Panorama from the summit looking back over my approach ridge on the right and valley at center. 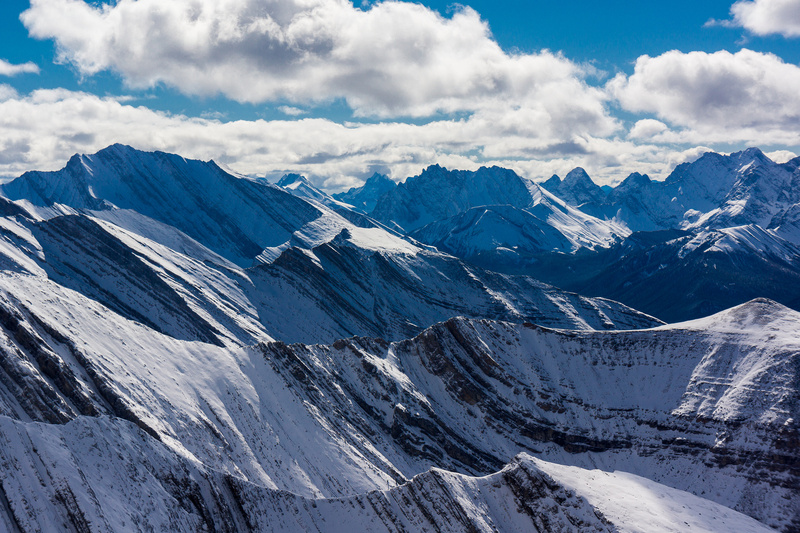 Kananaskis Village and many familiar summits in the background including, Kidd South, Kidd North, Bogart, Ribbon, Sparrowhawk, Lougheed, Allan, Collembola, Skogan Pass, Lorette, McGillivray, Mary Barclays and Mount Baldy (L to R). 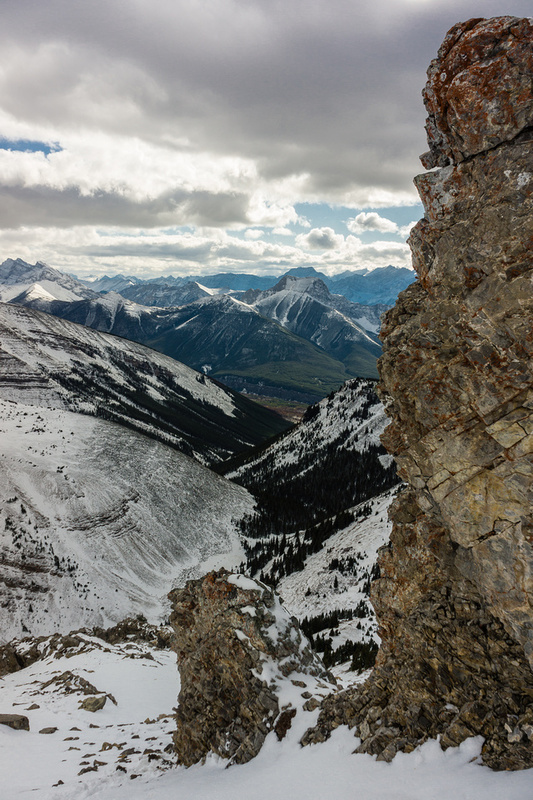 Great views down my approach valley and an outlier between Old Baldy Ridge and McDougall’s west ridge. Views south to McDougall along the interesting connecting ridge from Old Baldy. 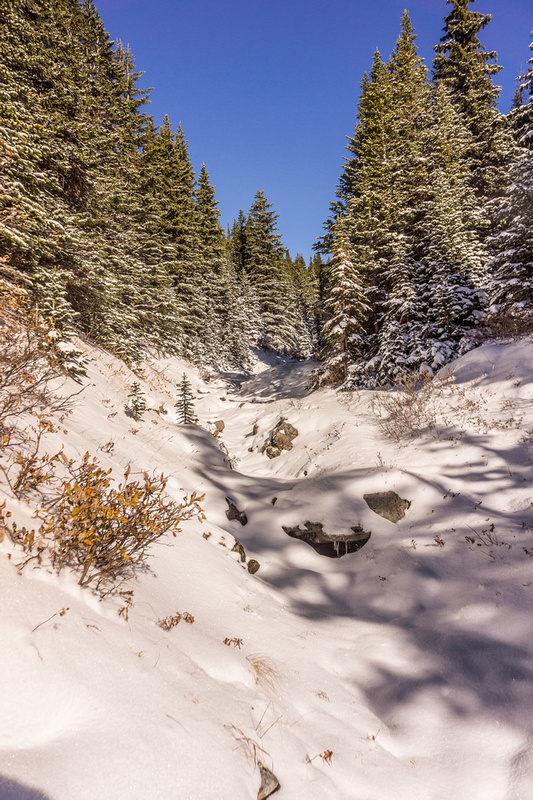 The views were incredible with all the fresh snow and as I replenished and gazed around I discovered some new energy. 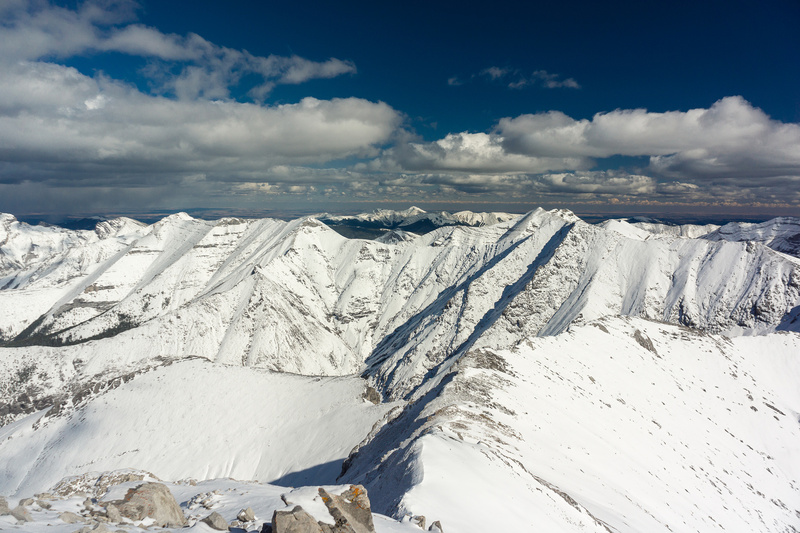 Amazingly I decided to try the traverse to McDougall – it looked a bit tough with all the snow but didn’t look that bad and the views were crazy so why not? The only issue was my escape route off the mountain. I knew from others that the traverse to Volcano Peak was not easy and the descent off that peak was hellish bushwhacking so I had no desire whatsoever to do that. 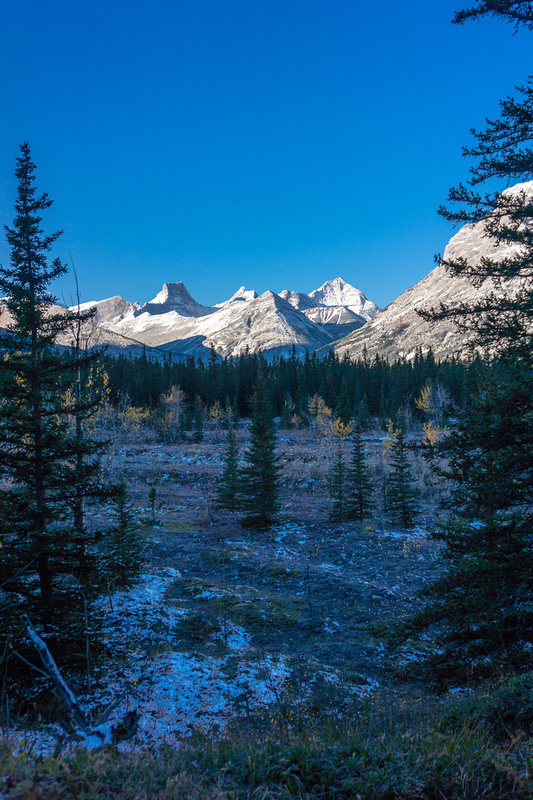 Nice views of Fortress, Gusty and Galatea already from near Evan-Thomas Creek. Two small cairns indicate the proper trail - lots of snow already here. 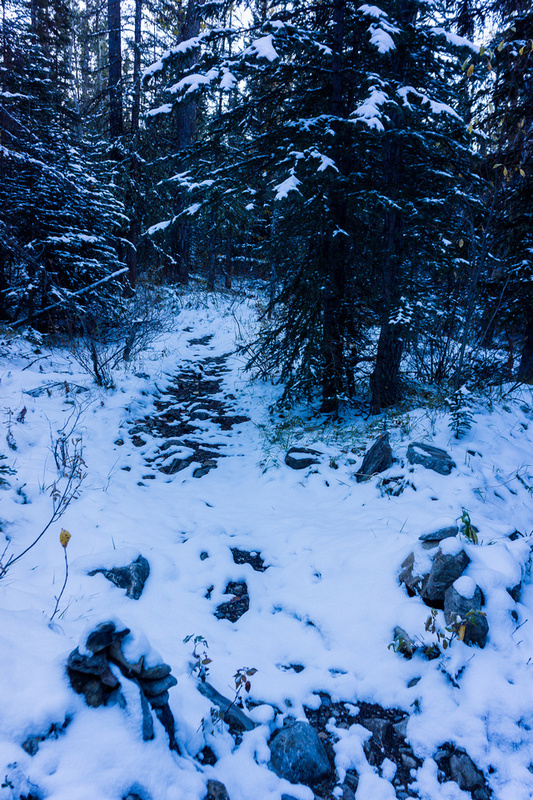 A small creek that I crossed soon after leaving the Evan-Thomas trail. The trail becomes less obvious the higher I get up McDougall Creek. The valley splits before the bump visible here and you want to be in the valley bottom to take the left branch. The trail was obvious in places. Looking back along my side-hilling approach. I'm off route and side-hilling now. I dropped into the creek bed on the right and went to the tarn which is around the corner out of sight. McDougall pond was almost completely dried up. This is where I started going up on climber's left. The snow was over ankle deep here. Looking down the snow gully. 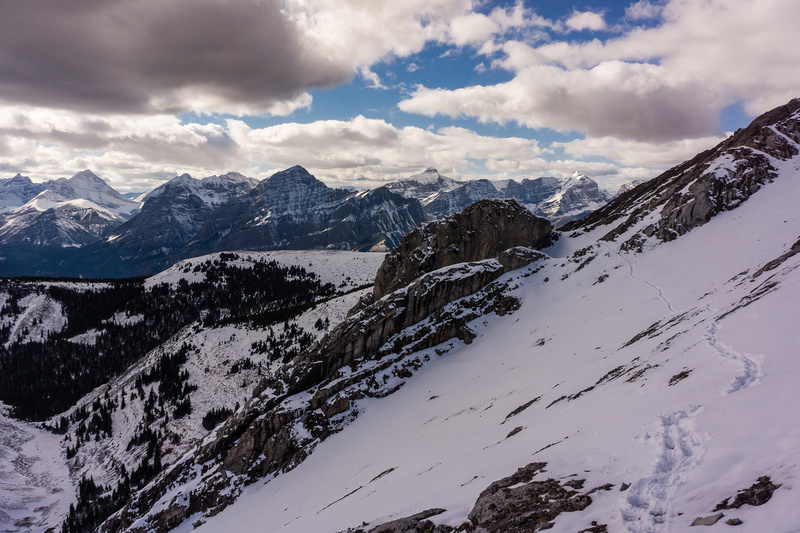 Gaining the upper ridge, looking at my tracks and Daffern's "Old Baldy" below - the grassy ridge. 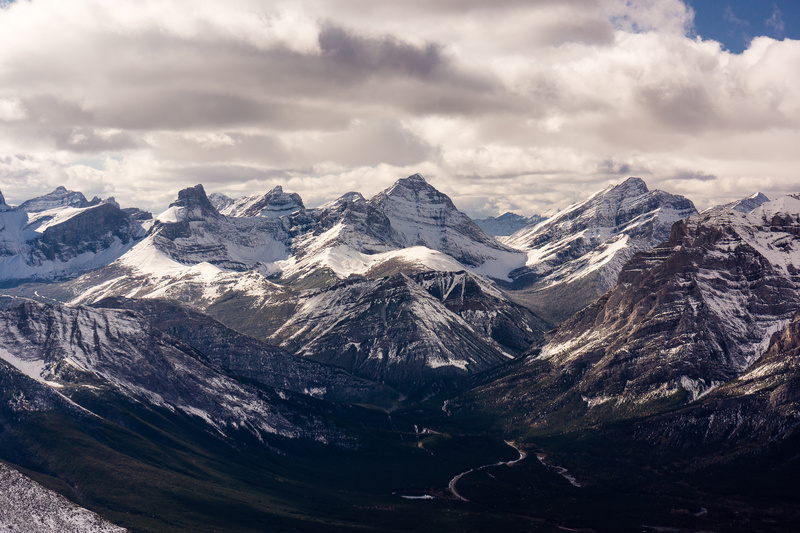 Kidd South, Kidd North, Bogart, Ribbon, Sparrowhawk, Lougheed, Allan, Collembolla, Skogan Pass, Lorette, McGillivray, Mary Barclays and Mount Baldy (L to R). 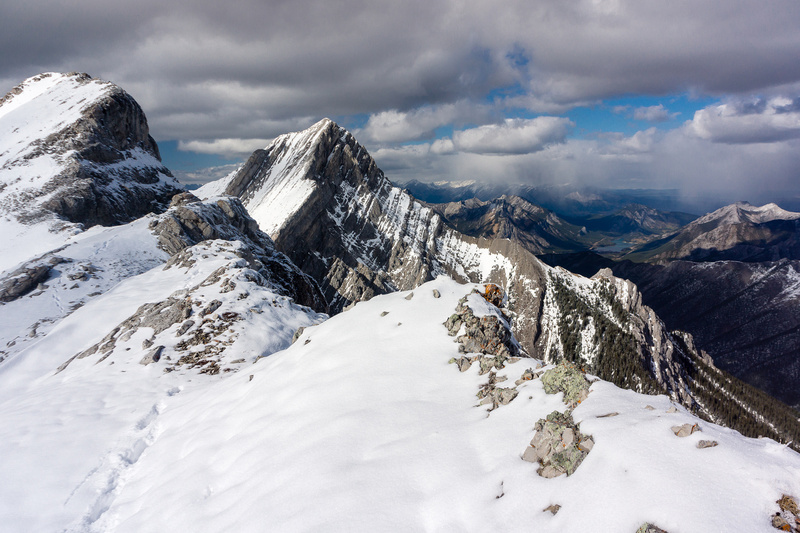 Great views down my approach valley and an outlier between Old Baldy Ridge and McDougall's west ridge. 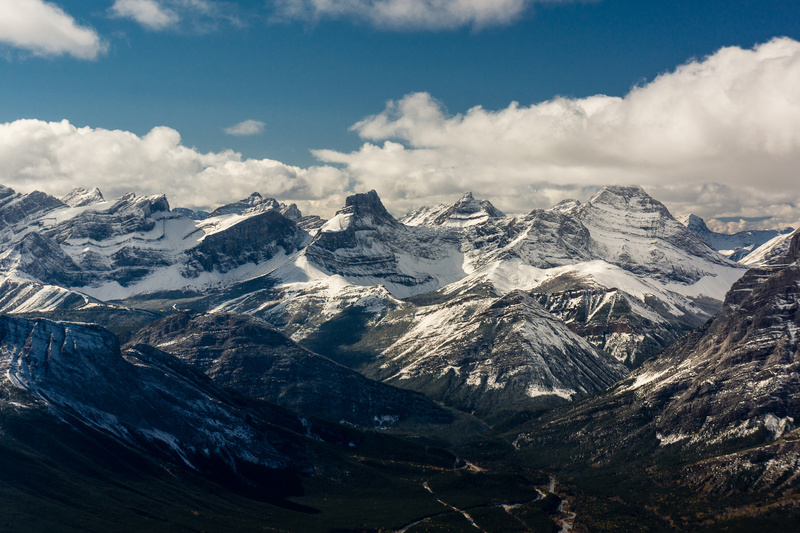 Views east and south include (L to R), Midnight, Midday, Boundary, Brown, Tiara, Bryant, Compression Ridge and possibly Mount Howard. 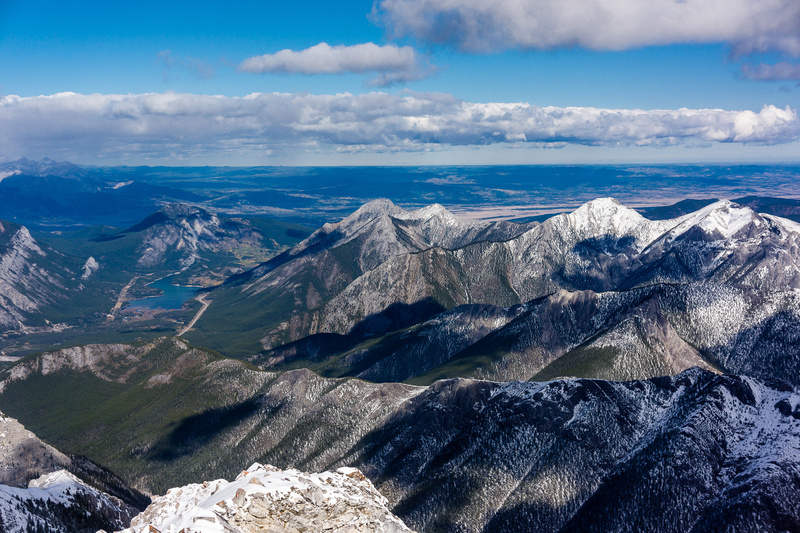 Looking over Barrier Lake and Baldy Mountain to the north. 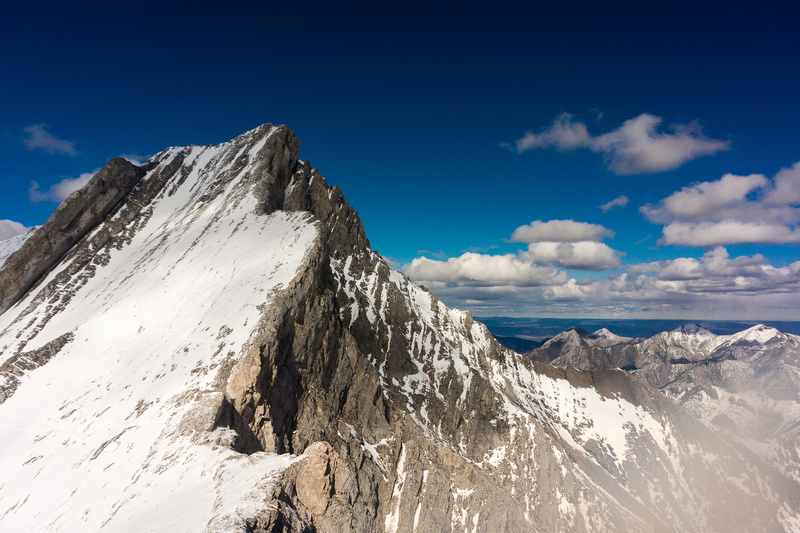 Midnight and Midday peaks to the right. 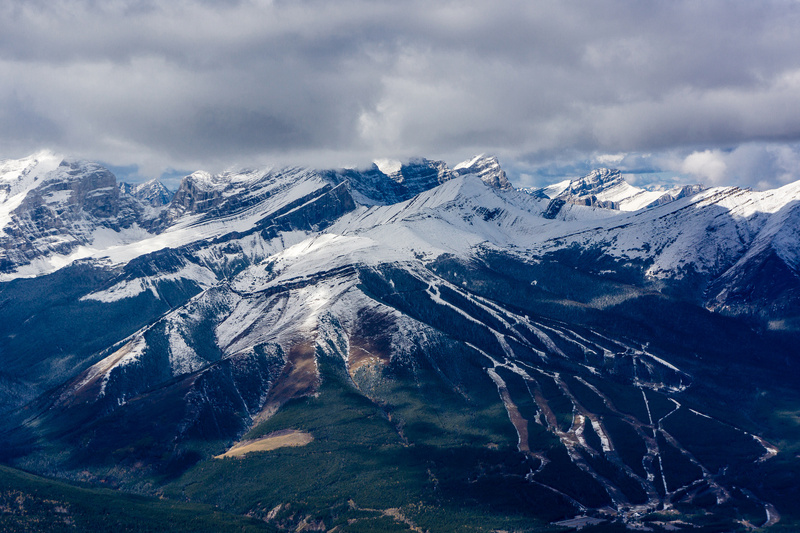 Looking over the Nakiska Ski Hill at Allan and Mount Lougheed buried in clouds in the bg. 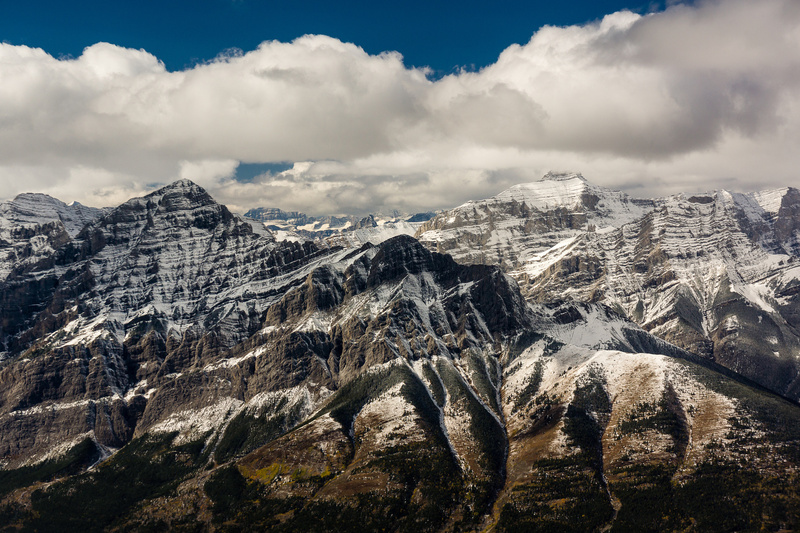 Mount Kidd is an impressive mountain. 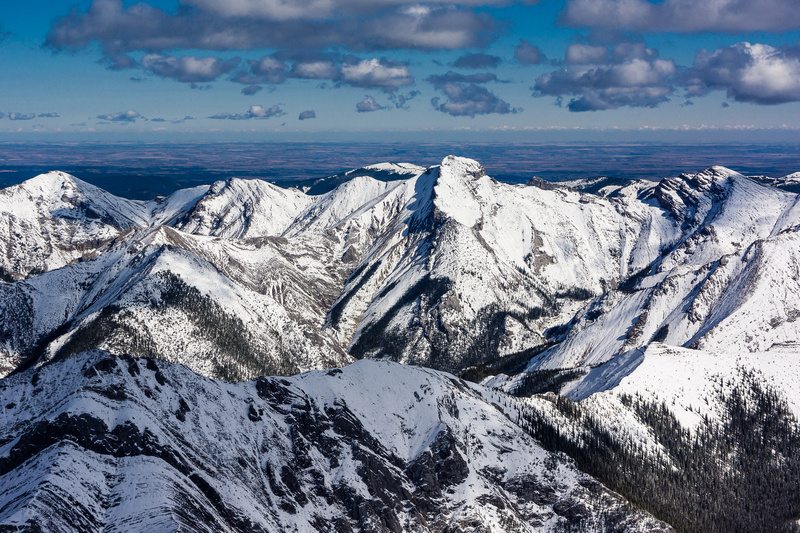 Fisher Peak on the left and Evan-Thomas East at center with other Opal Range peaks at right. 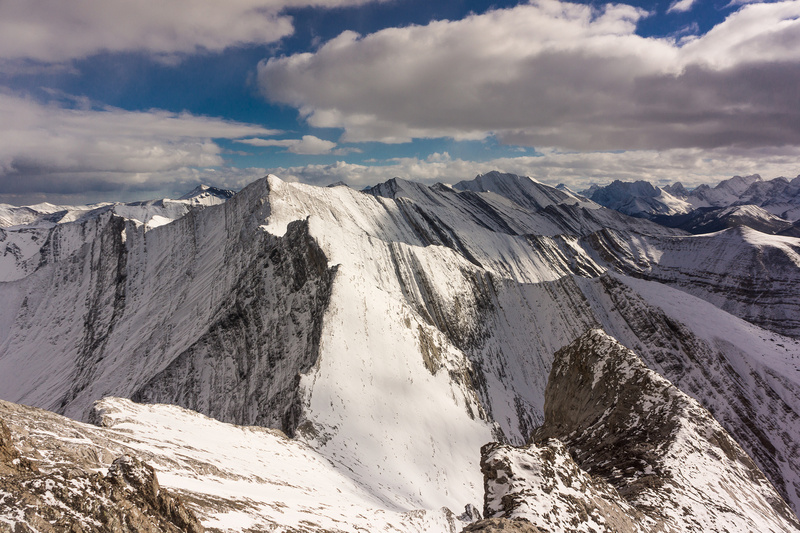 Looking over the ridge traverse to the summit of McDougall. Great shot of Chester, Fortress, Gusty, Galatea across hwy 40 to the west. Bogart is in the clouds - Ribbon Peak in front of it. Kidd on the left. 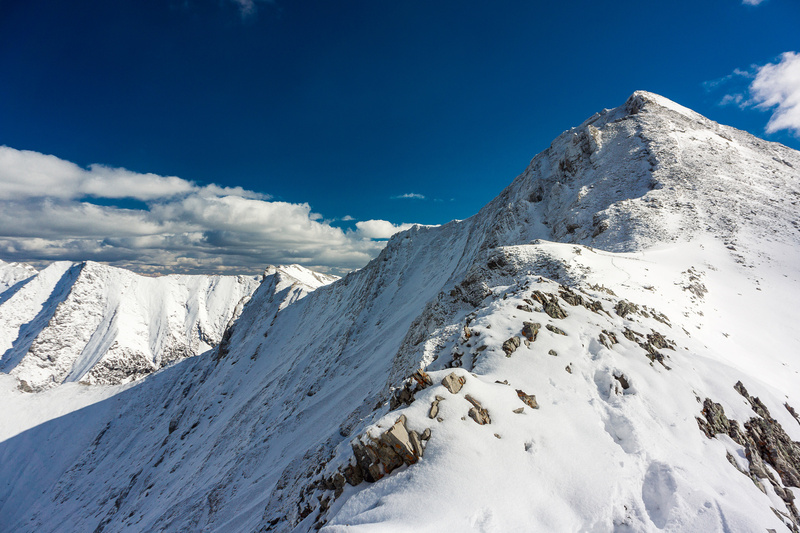 After struggling up Old Baldy in more snow than I was expecting I started the traverse over to McDougall – against my own better judgment I should hastily add! 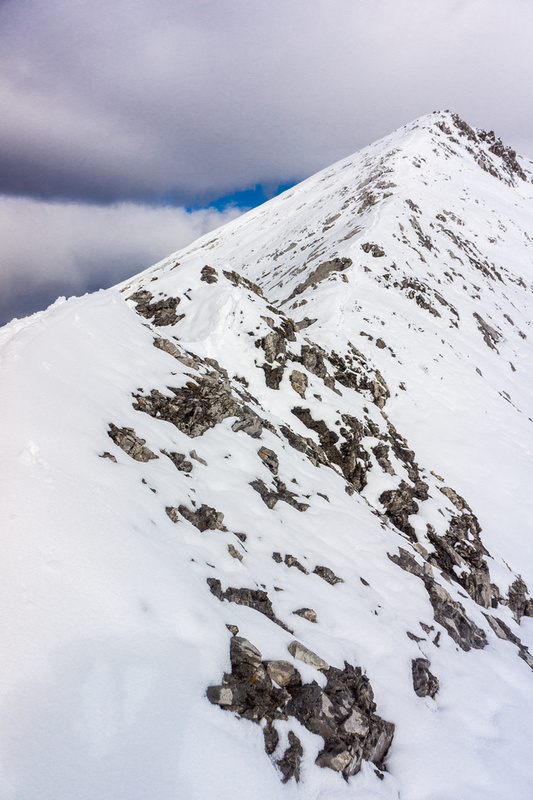 The ridge looked fairly straight forward but the amount of snow combined with the total elevation gain wasn’t looking attractive. 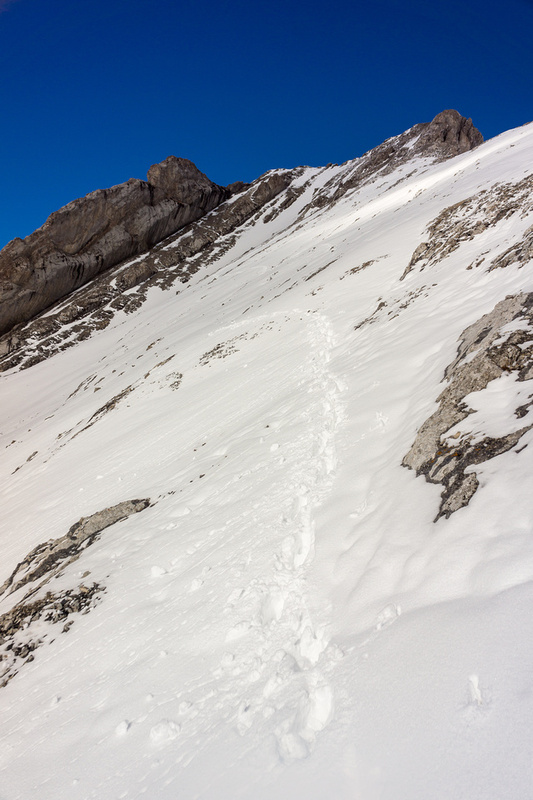 I descended the steep scree slope in snow up to knee deep and continued the traverse to the first bump. 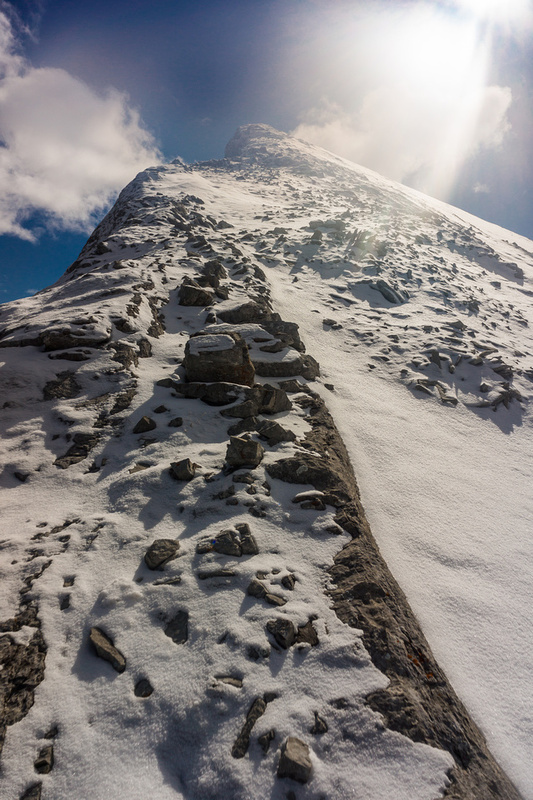 I ascended the bump no problem and continued on to GR362405 – a higher bump before the final slog to McDougall. 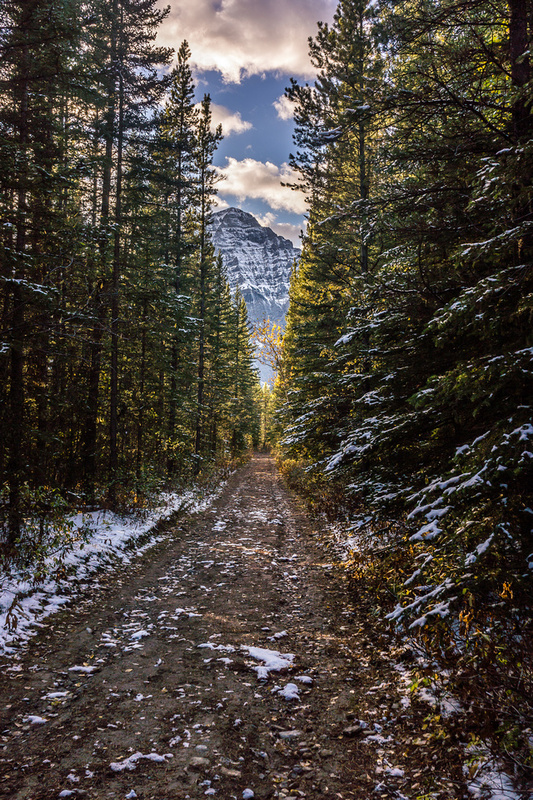 Nugara says that the traverse from Old Baldy to McDougall should take about an hour. It looks much farther from Old Baldy but even with snow and slippery conditions it took me 1 hour and 10 minutes to do the whole traverse. 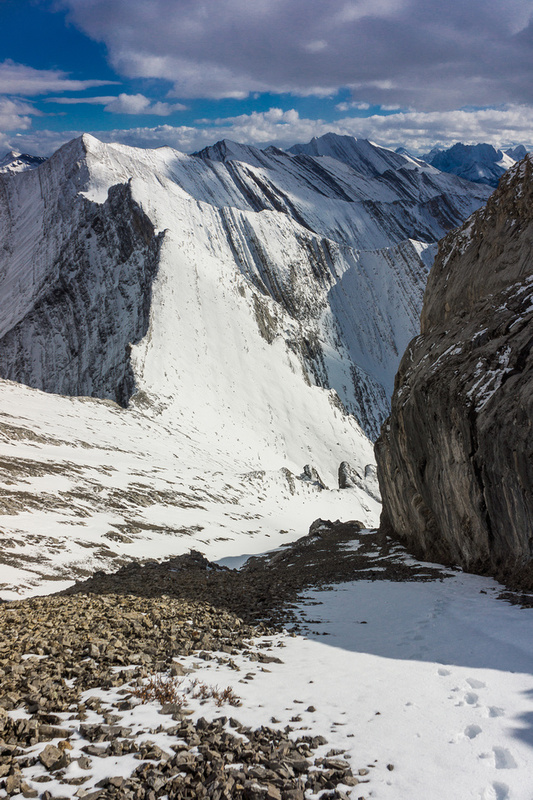 The ridge to McDougall looked intimidating in several spots, thanks to the snow, but usually it was quite reasonable and easy scrambling. Looking west and north with Old Baldy on the right. 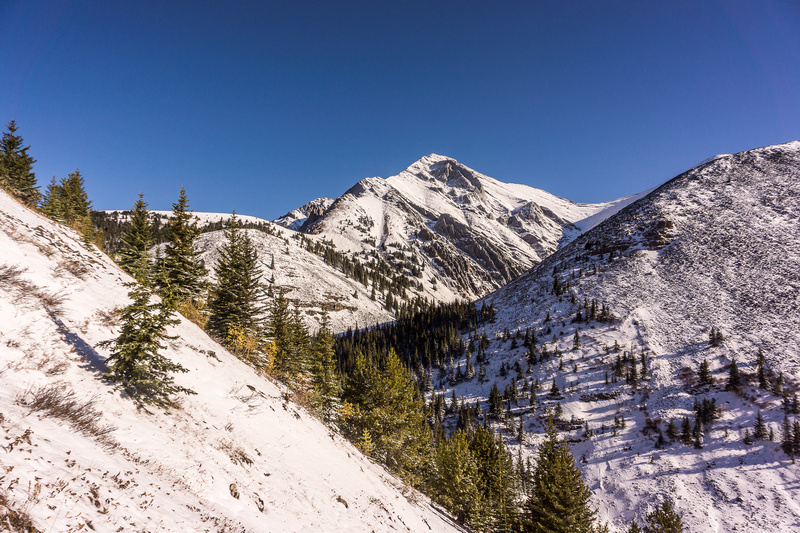 I could have descended down the west slope (left) but then I’d have to bushwhack out of the valley in knee-deep snow. Instead, I was hoping to descend the ridge in the center of the photo to the left and then off the end of it to rejoin my uptrack but that didn’t work out. 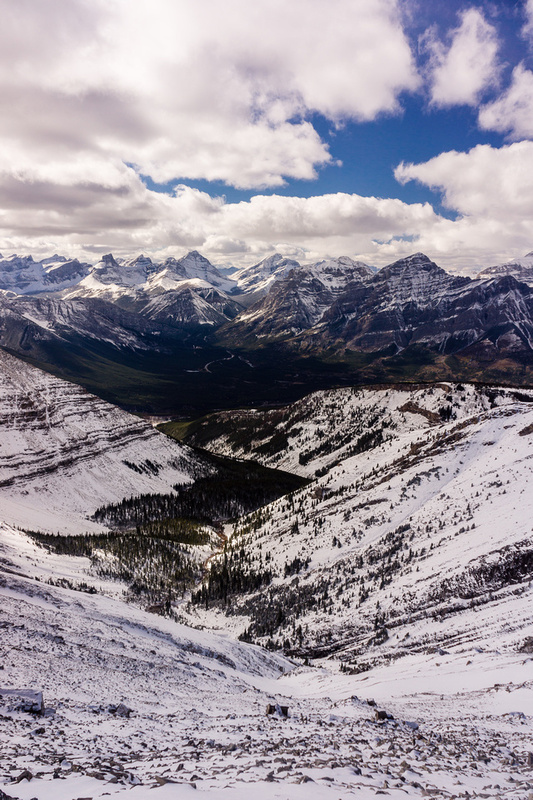 Looking east and south off the summit of McDougall. From right to left includes the Opal Range, Fisher, Howard, Fullerton, Compression Ridge, Bryant and others. 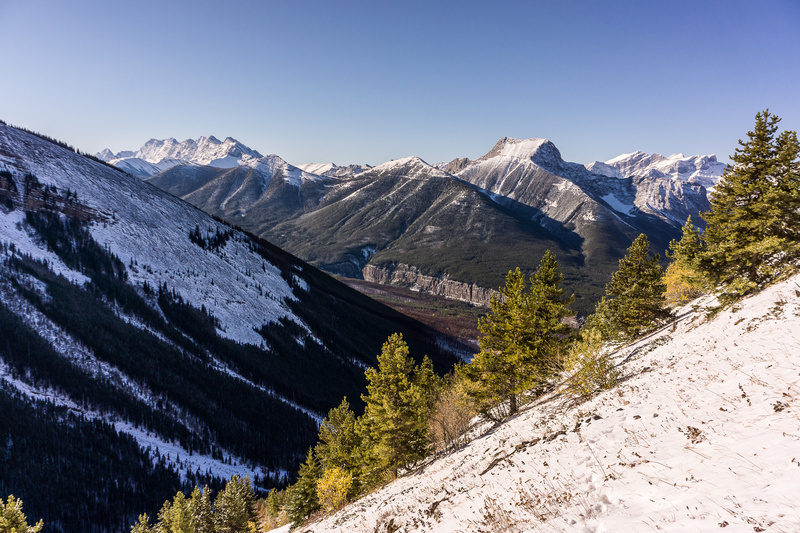 After snapping photos of the gorgeous snow covered peaks in the Kananaskis Valley and front country I had a decision to make. 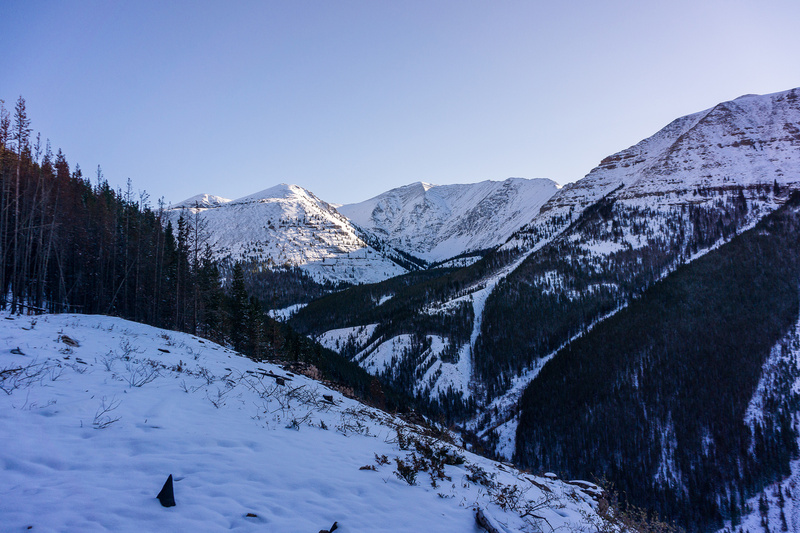 I decided quickly that I didn’t feel like messing with a steep unknown route down the west side of McDougall and also didn’t feel like wading through the snow in the valley below. I traversed back to GR362405 (first bump on the return to Old Baldy) and began the traverse to GR357404 instead. The traverse started out OK and slowly became more serious until I found myself looking down at an exposed and slippery slab with nothing but air underneath. Under dry conditions I would have attempted it but being solo and given the water ice on the slabs I reluctantly turned around and slogged back up the ridge. Traversing back along the ridge to Old Baldy. By now I’d been on the move for hours on end of snow slogging and was starting to get a bit tired of the peak bagging game. I decided to try one more thing before I’d give up and re-climb Old Baldy. 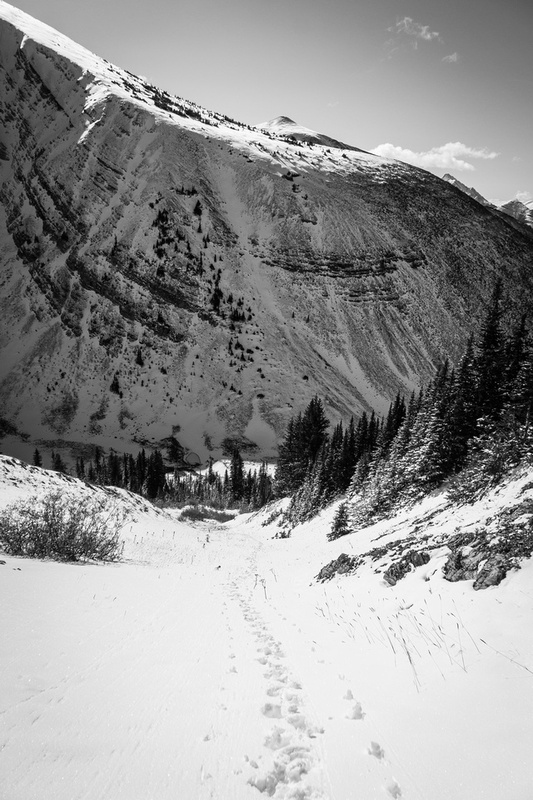 I’ve had good luck with following sheep lately so I thought I’d try following goat tracks across the south face of Old Baldy. This worked for about 10 minutes but goats apparently don’t mind water iced slabby rock with exposure! Crap! I really didn’t feel it but I had no more choices. I had to re-climb Old Baldy! No easy way around this terrain! 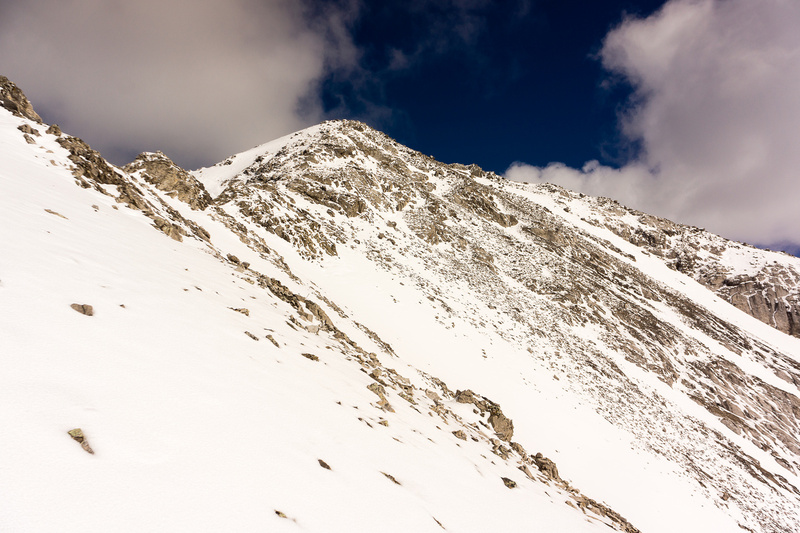 Turning back on the rib – I have to regain all this height to the ridge before turning left to Old Baldy. 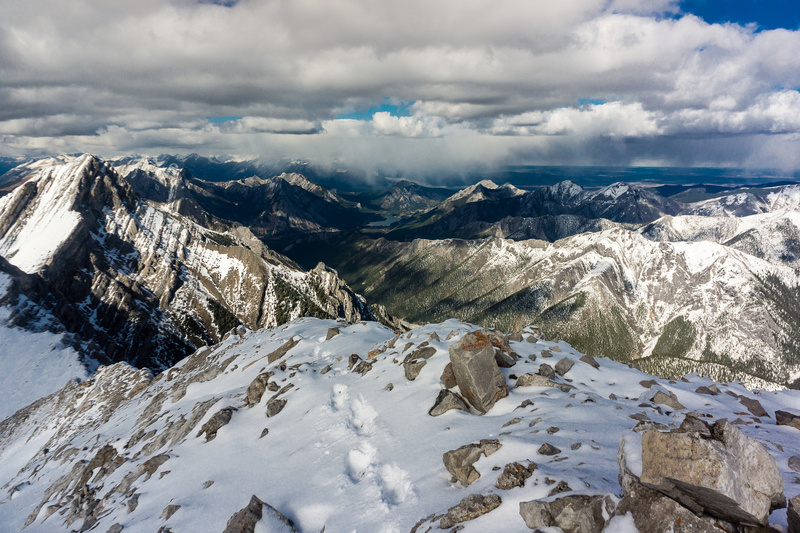 I took a while to ascend the 300 meters to the summit ridge of Old Baldy but eventually I made it and followed my tracks down the mountain. 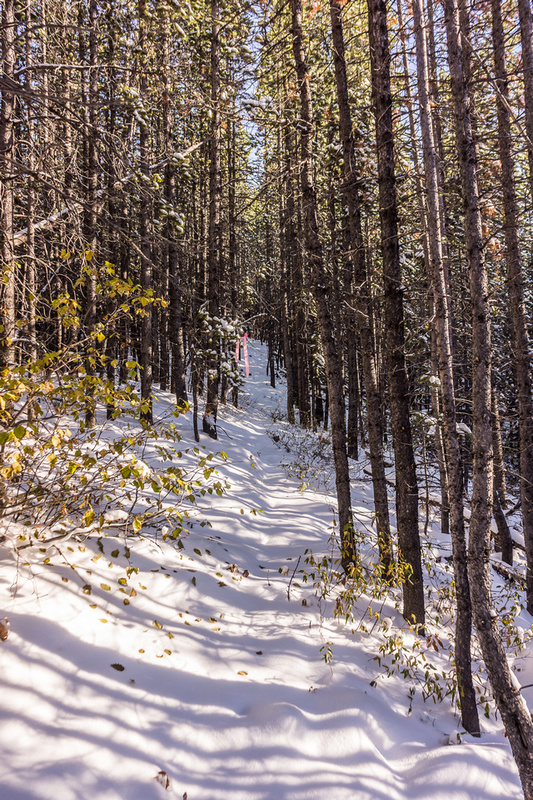 I was a bit frustrated again on the way back – I still couldn’t find the right trail with the all the fresh snow and ended up side-hilling and bushwhacking a bit before descending enough to have less snow and a good trail again. Overall the day was wonderful, with some really amazing views, but at 20km of hiking / scrambling and 1800ish meters of height gain it wasn’t an easy stroll, that’s for sure! I recommend this trip for drier conditions than I had. Looking back at my descent track from Old Baldy - I avoided the over hanging slab by traverse down and around it oos to the left here. Looking back where I came from - Old Baldy. The ridge is easy for the most part, with some short exposed sections. 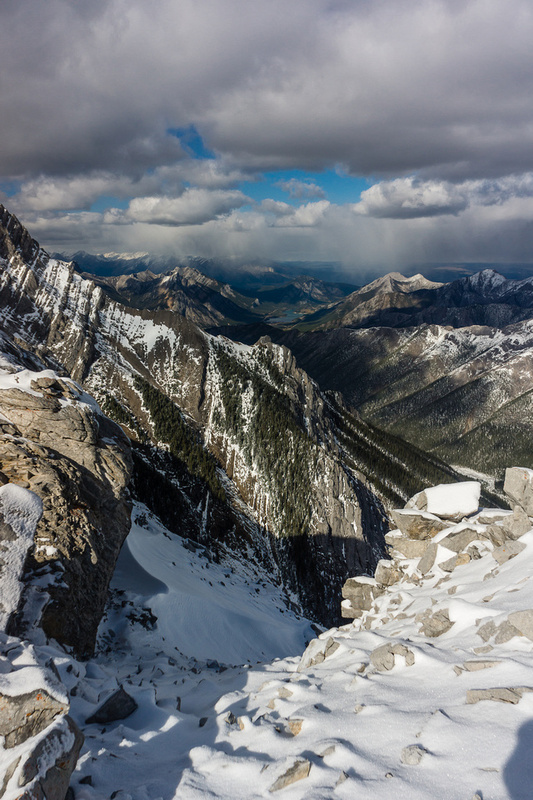 Looking north towards Old Baldy (right) and out to the west (C) from the a bump on the ridge traverse to McDougall. Looking towards the summit which is easy from here! 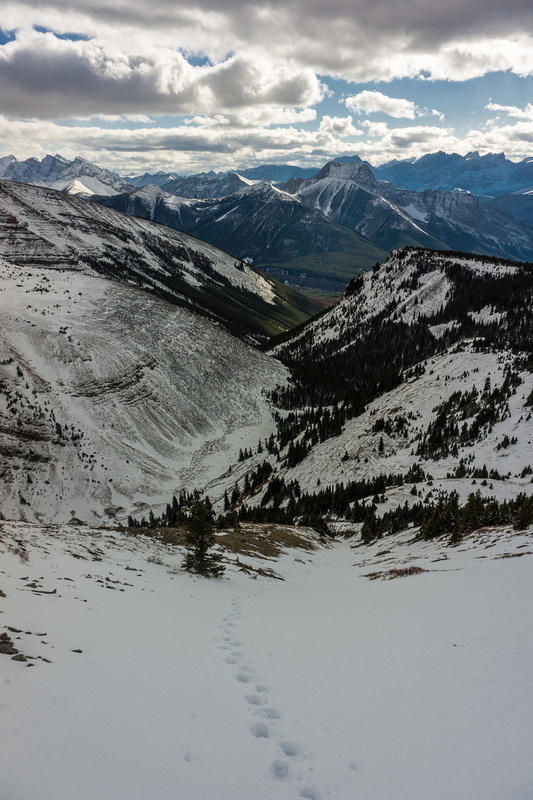 Final slope to the summit of McDougall - a little less snow for some reason. 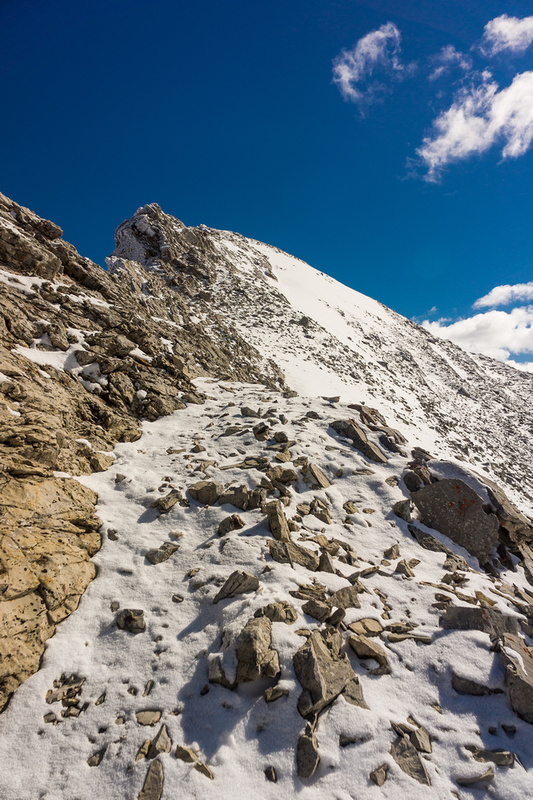 Looking back along my approach ridge to Old Baldy. 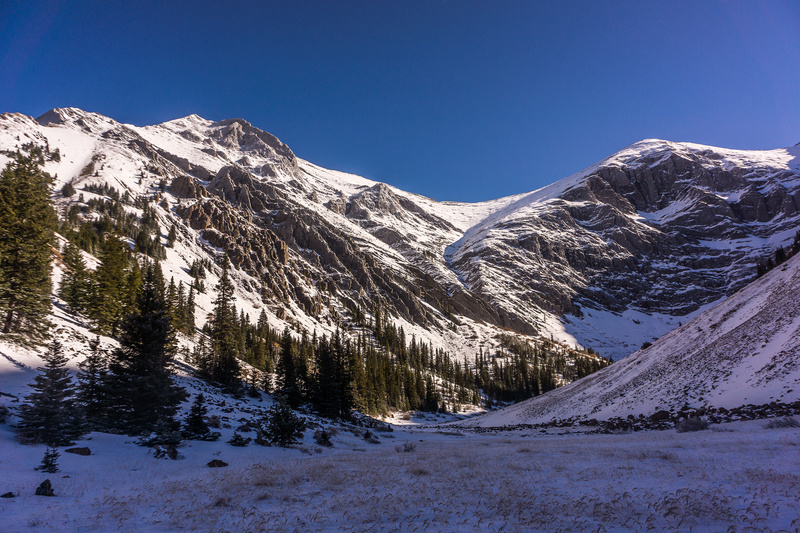 I could have descended down the west slope (left) but then I'd have to bushwhack out of the valley in knee-deep snow. From right to left includes the Opal Range, Fisher, Howard, Fullerton, Compression Ridge, Bryant and others. 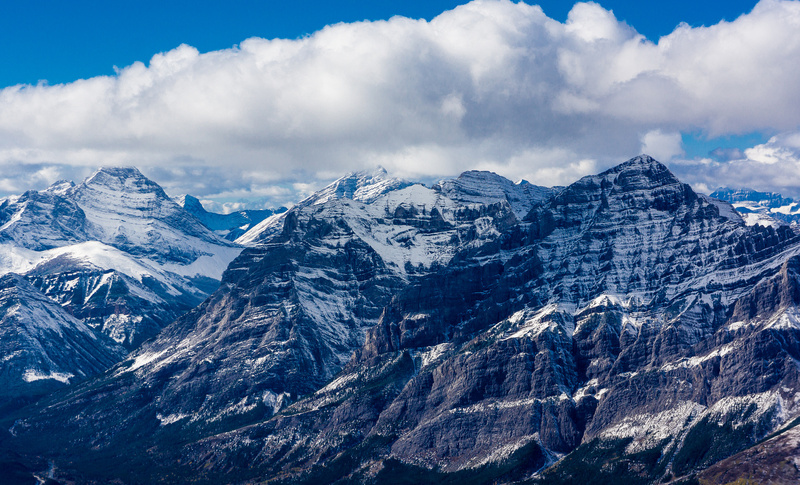 From left to right, Bogart, Ribbon and Sparrowhawk loom over Mount Kidd Junior. Chester, Fortress, Gusty, Galatea, Tower (L to R) from the summit. "Volcano Peak" is in the foreground, just right of center and looks tiny from here. 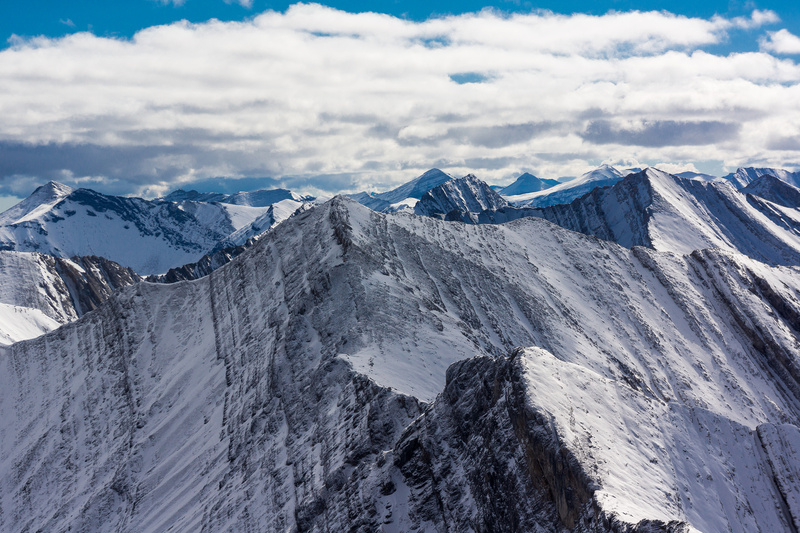 Looking towards the eastern Kananaskis peaks including Compression Ridge and Mount Bryant. Snow squalls are moving in over Barrier Lake with Baldy, Midnight and Midday Peaks to the right. A possible escape route but I'm worried about all the fresh snow. 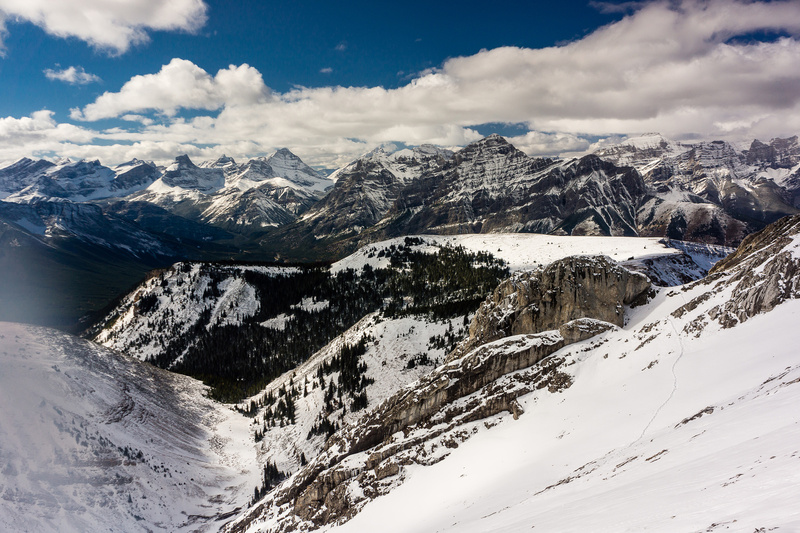 Looking back up McDougall from the ridge that I tried traversing. I was turned back after the bump you see straight ahead of me here. 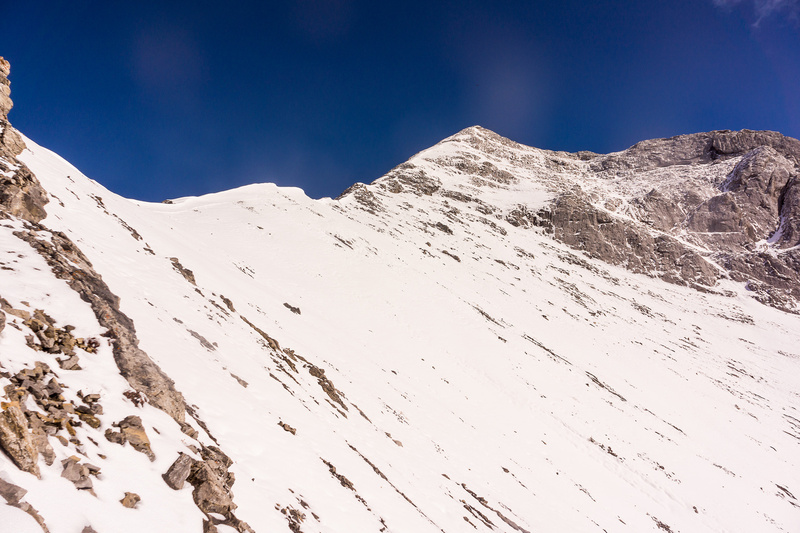 Turning back on the rib - I have to regain all this height to the ridge before turning left to Old Baldy. One more glance down the rib as I back track. My tracks which followed a goat trail to the right but I had to turn back again before giving up and heading up to the main ridge which is above me to the right here. Urgh!!! I have to re-ascend almost to the summit of Old Baldy thanks to the slab cliffs and the upthrust on the left! Looking back at my tracks ascending almost to the summit of Old Baldy on return. Finally on top of Old Baldy again - looking back at the traverse and McDougall left of center. More obstacles on the ridge, descending my Old Baldy ascent tracks now. Back in the snow gully that I ascended from the McDougall Tarn in the morning. Finally off the ridge! Looking back up ascent slopes to Old Baldy. The day is getting late as I work my way through light bush to the broad and easy Evan-Thomas Creek trail. A pleasant walk back to the truck on the Evan-Thomas trail.